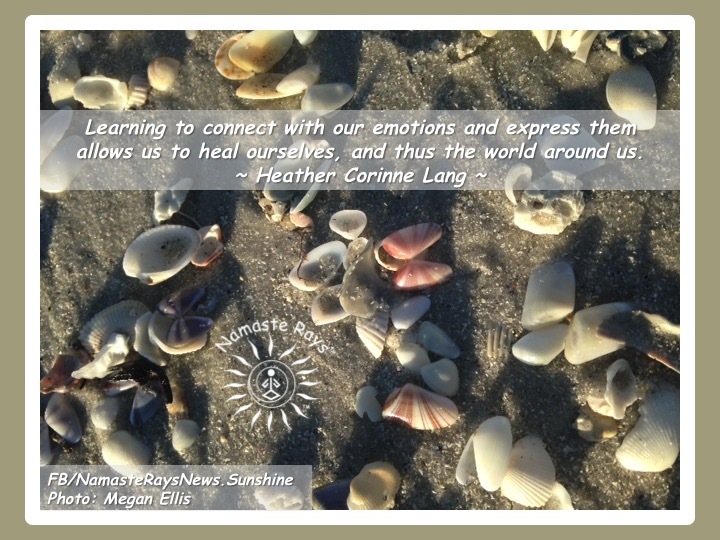 Learning to connect with our emotions and express them allows us to heal ourselves, and thus the world around us. The very nature of healing tells us we need to connect with how we are feeling and learn to express those emotions in a proper manner. We will have many different experiences on our life journey, and allowing any feelings to surface helps pinpoint the cause of the issue we need to heal. Perhaps an experience will bring up a childhood memory or something from another lifetime. I remember being “left out” of a circle of friends when I was around 11, which made me both angry and sad, as well as confused. A number of years ago as an adult, I recognized how upset I would become when I thought I wasn’t being included. I thought I was being forgotten, and this didn’t sit well with me. I realized it was because the little girl inside me hadn’t properly healed the situation. Of course, how could she? She was only 11! So, as an adult, I felt the feelings, released them and healed from them. Now, when similar situations arise, I don’t become upset. I understand how sometimes as adults, we have so many balls in the air, that at times, we may not remember all the individuals we have included or not included since our circles expand exponentially. We have increased the number of the people we care about and want to be around or keep informed of our lives and vice versa. We all do our best, and understanding we are all doing our best is key. My ego has been balanced from that time as a little girl. My ego wanted to be included, wanted to feel accepted and loved by others. Through the understanding and releasing process, my soul taught me that I’m the one to include myself, as well as, accept and love myself. I know when I am indeed meant to be included for my own higher good or perhaps to help others, it will happen. Of course, many lessons of self-acceptance and self-love will appear from other situations which need healing and have occurred. I now know how to take care of myself at these times, which brings more clarity & wisdom to me, which I can then share with those who wish to use it. The phase of comprehending where our feelings stem from brings us clarity, allowing us to express the emotion. It is the emotional connection. The connection between the emotion and the root cause of that emotion. Expressing the emotion helps us release it. Once released, we heal. As we heal ourselves, we learn more knowledge. As we accept this knowledge, we gain wisdom. This wisdom brings us further into balance between our ego mind and our soul mind. Our energy has become more balanced, thus the healing energy we exude helps others near us, which in turn helps spread the healing energy around the world. May you find your emotional connection and heal yourself, and thus the world. For an appointment or more information on my services, please message me. I look forward to helping guide you on your journey. Congrats Gerry!! Very fun, isn’t it!!?? I had one a few weeks ago featured on WU. Loved yours and shared it to my FB page. Love & Light!